Here are some easy science experiments for kids that can help you teach children everything they need to know about air and it's properties. Even though we can not see air, it can fill up a space. Question: How can we capture air? Blow up a ballon. What is inside the balloon? 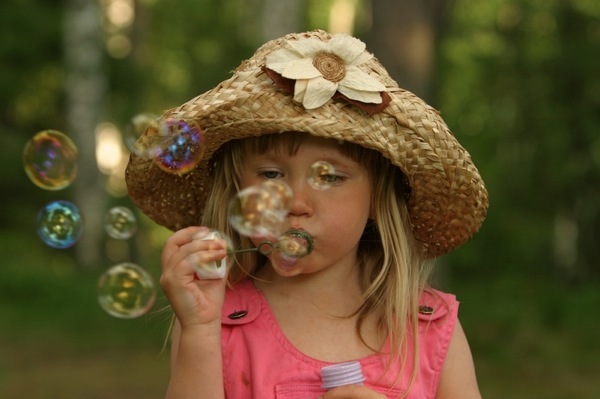 Let the children blow soap bubbles. The air from their lungs is creating the bubbles. A parachuter is able to glide in the sky thanks to the air his/her parachute captures. 1. Take a small square piece of material and attach strings to it's four corners. 2. Take a small doll and attach the other ends of the strings to it. 3. Throw the parachute in the air and see how it slowly lands safely. Anything that can shake or vibrate moves the air and thus creates a sound. Did you know that without air there would be no sound? In outer space for example there is no air and no sound! Here are a couple of easy science experiments for kids that will help you explore this property. 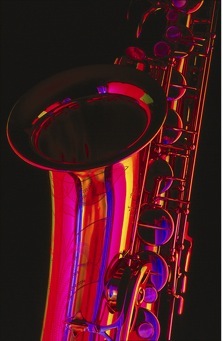 Experiment with horn instruments such as a trumpet, saxophone, tuba and so on. 1. Cut string in different lengths. 2. Attach one end of the strings to the bottom of a strawberry basket. 3. Attach bells to the other ends of the strings. 4. Add a string to the top of the basket creating a handle. 5. Hang the chime outside. 6. Does it make a sound when it is windy? Our planet is surrounded by air even though we can not see it. Here are some simple ways to bring awareness and new appreciation for air. Even though we can not see air we can feel it on our skin. Using a variety of fans (hand fans, electric fans and ceiling fans) explore the air around. It is cool? hot? When air moves it is called wind. Strong winds are able to move heavy objects effortlessly. What makes sail boats small and massive move? Explain the importance of the sail and why it is shaped as such. 1. Tape clear acetate paper onto the window. 2. Look through the paper and choose one cloud. Trace it. 3. Wait a minute, remain in the same spot and re-trace the cloud using a different color marker. 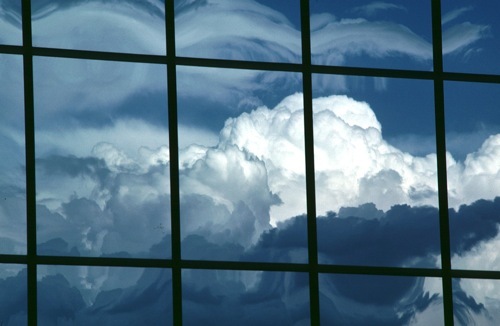 What makes the cloud move? How come sometimes clouds move fast and sometimes slow?